Ah Fall. It makes me dip into the comfort foods. Good thing my boys seem to love soups so much. We had some green grapes, New Mexico style cornbread (it has green chilis, sour cream, cheddar and corn in the batter) and my Southern Style black eyed peas - for which you can find the recipe here. They are quite healthy and economic, have lots of flavor, and the recipe makes a large amount. 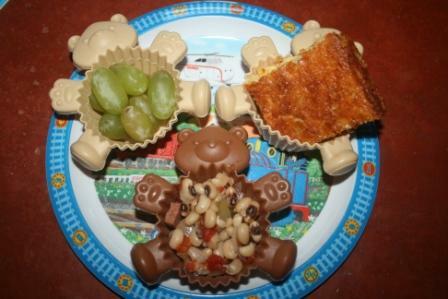 If you'd like to see more ideas for kids' meals, go visit Muffin Tin Mom. I want that muffin tin Monday! Love the tins! So cute. And your corn bread sounds awesome. This meal would warm me up on a chilly day! The corn bread really sounds amazing! That cornbread loos and sounds delicious. Recipe please! Beans and cornbread = complete protein and one of my favorite meal combinations; yours looks very good. It all looks so good! And cute! The cornbread does sound good and of course I love those muffin cups. Love those muffin tins, so cute. MMMmmmm black eyed peas and cornbread. I think I might have to come to your house for supper. I suppose we were think alike somewhere down the menu road, I had blackeye peas on Sunday! We make a jalapeno corn bread--yum! It hasn't gotten very cool here yet, but enough that I feel like baking again! I finally got around to visiting Muffin Tin Mom, there are some great ideas on her site!Lots of creativity. THose are my idea of comfort food. And I'll say it again, Lisa, I am in awe of what your kids eat! Love, love, love Mexican cornbread!! Oh goodness!!! That looks amazing! I will have to find a recipe for the bread! Did you make it? It is neat how he gets introduced to all kinds of food. I was a super food fussy kid. I love corn bread with black eyed peas! I might have to make some later this week when it gets colder outside. I made veggie soup yesterday evening and we had it for dinner tonight! It would be so fun to eat out of those muffin tins. love me some black eyed peas! yummo!